Or rather, I had a dream. The other morning I was having a lovely dream until the boss kicked me out of bed to make the chickens coffee, unload the dogs, feed the dishwasher and let her out. I don't fire on all cylinders that early. Anyway the dream I think owes something to a guy called Michael Hill, who Ivor Macfarlane and Alan Nance will remember as one of the early ITIL lecturers at Sunningdale and who also ran a great project management course in conjunction with Outward Bound. So what was the dream? It was about a portfolio of ITSM simulations designed to be run as non-classroom events. Either outdoors or designed from scratch to work at big conferences Unfortunately by the time of my rude awakening the only one that I'd worked out was about getting disparate and diverse teams to realise they had common targets in common. Just a dream, or does it have legs as an idea? Well, initial responses to the idea seem very positive, and some very welcome input from the Back2ITSM community on things it has to address, like inclusivity, diversity, and the no-win scenario. But there are at least four big questions that worry me. How do we embrace diversity and inclusivity? Who would develop it commercially? What on earth would the course look like in reality? Could I still pay the mortgage? Overwhelming me is the thought that this is needed, but how to make it happen? 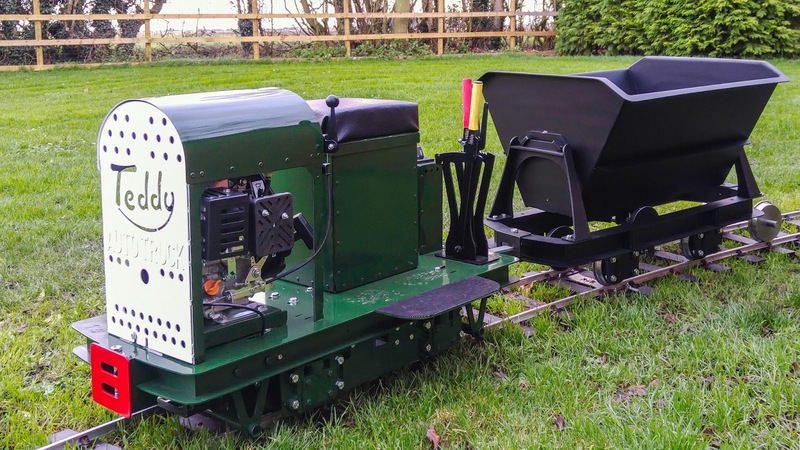 An existing training company, a kickstarter campaign? It is with very mixed feelings that I post here for the first time in a long time. On Tuesday night I was honoured to receive the itSMF UK's Paul Rappaport award for a lifetime's outstanding contribution to service management. I hope that during that lifetime I have encouraged many people to stand up for for the things they value and to reappraise how they see the world and how their actions impact others. I am eternally grateful to those of you who have come forward and said that I might have done that to some degree. At the beginning of the Awards Dinner, Sally Bogg gave a very powerful speech about how our industry needs to change. And I echo everything she said, and look forward to the future. But my joy at receiving this year's award is tempered by the death last week of my wonderful cousin, Danny. What follows is a rough transcription of my ex tempore speech on the night. For those who were there, I apologise for any inaccuracies, but this is what I would have said had I had time to prepare a proper speech. It is what I meant to say, even if I didn't say it at the time. "I am extremely grateful to receive this award. There are so many wonderful people I've met during my career in this industry, some no longer with us, like Ashely Hanna and Paul himself, and others who aren't with us tonight, like Ivor Evans and Alan Nance. And I continue to meet new people who inspire and encourage me. Well as many of you know, last year he did win it before me, so all is right with the world. And normally that is where I would have finished this speech. But with your indulgence, I want to make some very serious additional points. Early last week my beautiful cousin Danny killed himself. Yes, I know, I'm a bit of a party pooper. But I want us all to take some positives away from this. Danny was in the building industry, a steel erector, tattoed and up for anything. He lived in the same small market town I was born in. His brother and sisters lived in that same small town, the aunt who loved him as a nephew did, and she also has the misfortune of being my mother. We are a very close family. And none of us knew how he hurt, how he felt. The last time I spoke to him online he told me how happy he was. My beautiful cousin Danny killed himself. In the organisations we work in, and particularly in the IT departments, the ITSM professionals are often the focal point for an emotional, human, view of the world. We know that many of our colleagues might be somewhere on the autistic spectrum. We also know that we, ourselves, are often working in very stressful conditions. Please look out for others. Please look for the signs of stress. And not just in others, in yourselves as well. In the last week, I have been overwhelmed by the support I have received from our ITSM community. Both online via the Back2ITSM group on Facebook and in person during SITS. I am sure to have missed someone out but I've received messages of love from New Zealand, Australia, India, South Africa, Russia, The Scandinavian countries, Europe, the UK, Mexico, the USA and Canada. It is incredible we have become such an international community and family. And we should be very, very proud of that. Many of us did not know the immediate trigger for Danny's death at the time, but in retrospect, I think he never recovered from seeing his mother, my much loved and missed Aunt Cindy, taken away from him as a child. Taken away from him, from her other children, from her husband and from everything a mother should be, at far too young an age, by that cruellest of diseases, Motor Neurone Disease. I don't want to take anything away from tonight's charity, because I suffered from learning difficulties as a child myself, but some of you will recall that for my birthday this year I requested donations to the Motor Neurone Disease Association. If you could give them some donation, and in doing so remember my cousin Danny I would be very grateful. As indeed I am to the Directors of itSMF UK for this award. Now please enjoy the rest of your evening"
SIAM, Service Integration and Management, has become the default sourcing strategy in many parts of the world. It can transform the way IT services are delivered. Yet it remains poorly understood and not all moves to a SIAM model have delivered the expected benefits. So what is SIAM, and what distinguishes the successful approaches? SIAM begins with identifying the desired end to end (E2E) outcomes and then constructs a contractual and managerial framework to achieve those outcomes. This can be achieved in many ways, but a common approach is for the internal IT department to establish a Service Integration team that calls upon resources from one of its strategic suppliers as well as internal resources. Working with strategic suppliers who are willing to commit to those outcomes and share the risk of not achieving them is key to SIAM. In return for that commitment suppliers need the freedom to innovate and optimise their services. A common failing is to expect suppliers to sign up to the delivery of business outcomes and risk and reward models that are incompatible with the detailed contractual terms specifying how their services are to be delivered. The approach to the contractual framework has to be realistic and appropriate to where suppliers are in the value network. Unlike traditional sourcing models, a vital element of SIAM is that value network perspective, in which all suppliers are seen not just in terms of their own encapsulated responsibilities, but in terms of how they work in combination to achieve mutually beneficial outcomes. Commercial realities have to be taken into account and this is particularly the case when sourcing commodity services. The advantages that SIAM provides in these areas, particularly the plug and play approach of constant competition between commodity suppliers to provide dynamic capacity comes at the cost of having limited control over the services levels they provide. Unfortunately, many organisations have adopted SIAM after signing up to cloud services that have very limited service levels and expect SIAM to fix this by re-negotiating the contract. This is rarely feasible. Although much of SIAM thinking developed from a perceived need to make external suppliers "play ball together" it is clear that SIAM needs to embrace integration across enterprise IT and IT in the Business. That integration also needs to be orchestrated across the service lifecycle. Whilst ITIL provides a useful foundation for SIAM it is only part of the overall SIAM capability that an organisation needs to consider, along with programme management, security, architecture and transformation. Because of the scope of SIAM it is obviously important to recognise that changing to the model has itself to be a long term strategic transformational activity. That in turn requires strong governance, clear responsibilities and a commitment to organisational change management if it is to be successful. And to end where we began, that success has to be judged in terms of business outcomes, not improvements with the IT department that are never passed to the business. Getting business buy in to the new approach requires the senior IT team to build a robust business case based on tangible improvements. This has been my quietest ever year for blogging. Partly that is because of how I use the Back2ITSM Facebook group, partly it is because a lot of things have been happening in the day job, with a restructuring and a new role. On top of that we've moved house to the other side of the country, downsizing in response to the children being thrown out leaving home. 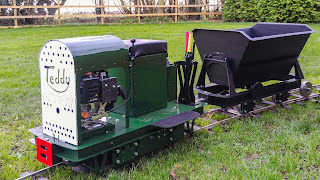 Oh, and I also started building a railway. Looking back on my predictions for 2015 I think I did rather well. Well sort of of. People will realise that not every one claiming to be a SIAM expert is what they seem. I certainly saw some evidence of this during the year. There are still people out there claiming expertise who are still purely theoretical, who are extrapolating universal truths from a single experience of "implementing" SIAM, and who have no operational experience in the area. I'm glad to say that at conferences at least audiences seem more able to distinguish those speakers who have coal face experience. It really was a no-brainer to suggest that this would primarily be DevOps. However from a personal perspective it was CX/UX that I found myself talking about the most. People will start talking about having a career structure in ITSM again. This has become more and more apparent at conferences this year. There are a group of people out there who have yet to grasp just how hard SIAM is, and that they lack the fundamental skills to make it work. They believe that all you need to make it effective is a new organisation, some process guides and refreshed job descriptions, despite their long track record of failing to get the basics right. They will be pandered to by the new breed of instant experts in SIAM. Many of the initial SIAM contracts are coming up for renewal, A lot of lessons have been learned, and a lot of changes have been made. Expect a lot of action in this space, with a lot of incumbent SIAM partners becoming undeserving sacrificial victims of poorly thought through first generation deals. For a long time now I've been arguing that whilst the core content and intent of ITIL might still be relevant the way we build ITSM solutions and how we expect users to interact with them is fundamentally flawed. When I was an undergraduate AI was one of my pet subjects, In the early days of my career I played around with virtual flatworms . One day I thought, all this might come in useful. Well I'm pleased to say that in an ITSM context that day is fast approaching. In TCS we have already developed our Ignio solution and you can expect to see us leveraging it on more and more ITSM accounts. So that is it for another year, except to say thank you to all of you across the international ITSM community who have once again been excellent, entertaining and enlightening company. Sometimes even the tumble weed analogy doesn't really do my limited socmed presence justice. The prime reason I've been lax in updating this site recently is how fast things seem to change in my immediate world. Of course as soon as you lift your head up you realise that everything around you has stayed pretty much the same, and that the rip tide you've spent the last half hour fighting went totally unnoticed by the watchers on the shore. The future is bright, the future is SIAM. To my honest amazement I've found myself in my mid fifties leading a wave of ITSM innovation . After all I'm less Generation Y than Generation What Did I Come Into This Room For? A future blog might highlight how wrong that state of affairs is, but for now lets accept that I do actually have my finger on the pulse of the ITSM global community. 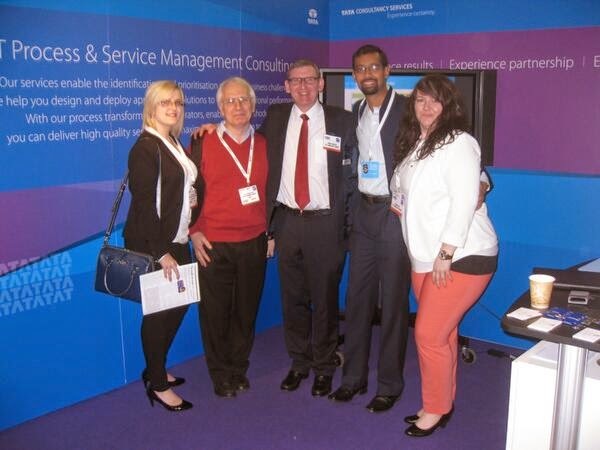 So what are my feelings, especially after this weeks itSMF UK conference? First the good news. The conference exceeded my expectations in every dimension except for the quality of the coffee. The venue was relatively accessible, the atmosphere was, to quote my colleague @itilpunk "intimate" the sessions and debate were relevant and the vendors were fully engaged. I'm in a difficult position when it comes to discussing the future direction of itSMF UK because I've been involved in some of the behind the scenes debates, but generally I'm happy, and I have every confidence in the new chair, CEO, and board of directors. Some really positive messages came out of the AllthingsITSM podcasts I guest hosted on. For once I missed the gala dinner but it was worth it to spend time with Ivor Macfarlane and Luciana. There is no nice way of putting this. I bit my tongue at times but if you think devops = agile, that service managers need to be more technical and that painting a picture of a framework based utopia without any idea of the pain involved in getting there is the future of ITSM then you've forgotten the lessons a lot of us have had to learn the hard way. Above everything else please, please realise that spouting jargon and yet more jargon is not the answer. There were a couple of "conversations" in which I just nodded at what I hoped was the right point, rather like talking to my dear old doric speaking step-nan. And though Tony Price is a worthy winner of the lifetime achievement award I'll say yet again that it is a scandal Ivor Macfalane has yet to receive it. Who Will Go To The Ball in 2015? It is that magical time of year when ITSM pundits everywhere make their predictions for the coming year, safe in the knowledge that no one ever checks up on how well their predictions have performed in the past. Well possibly Rob England does. So ignoring my previous and frankly repetitive predictions from other years what do I think is going to get us all excited? By now I hope you've realised SIAM is well along the hype curve but here are my two SIAM specific predictions. Number 1: People will wake up to the number of "SIAM Experts" out there who actually aren't. They've either never done it, done it once, or know somebody else who has done it. Number 2: People will start talking about "SIAM and....." Insert buzzword of choice but DevOps has to be one of them. Number 4: People will start talking about having a career structure in ITSM again, for the first time since the late 90's. Number 5: OK this is an old one I'm re-visiting, but I sincerely hope there will be at least one conference this year that breaks some boundaries and includes ITSM, project managers and architects. Many of you will have played the Apollo 13 ITSM simulation. Many more of you will have seen the film. Some of you might have been sufficiently intrigued by the story to go in search of more information about NASA and the lessons we can learn from both their successes and failures. Some of those lessons were clearly described by Col Hadfield at the last Pink conference in Vegas, for instance the need to practice failure. What you almost certainly won't have done is to attempt to run your very own space programme. 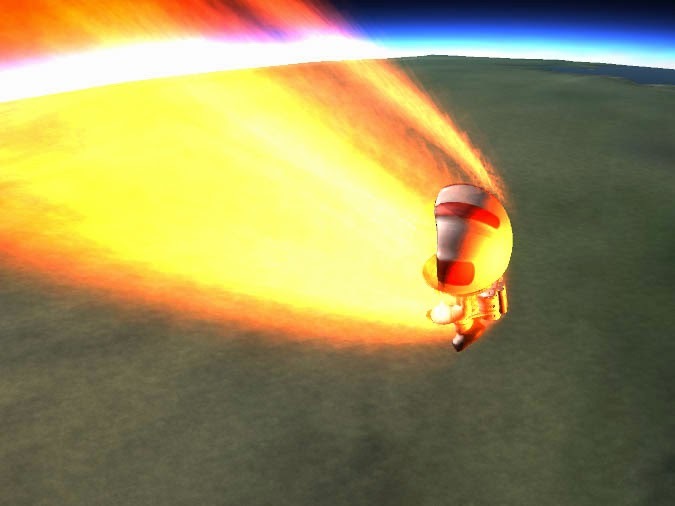 Let me introduce you to Kerbal Space Programme. 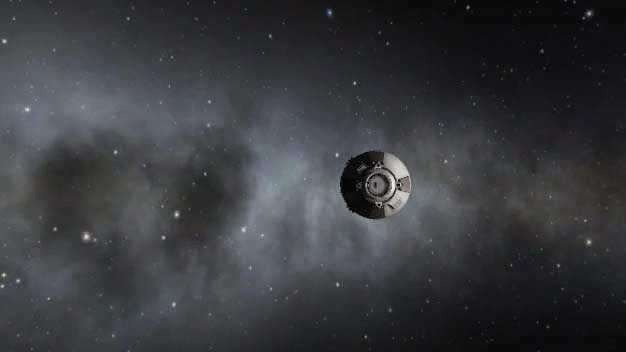 Just moved into a beta release it offers you the chance to build up to manned, or at least kerballed, interplanetary space exploration from very basic beginnings. So what are some of the lessons a game like this can teach you that are transferable to ITSM? Gene Krantz, the crew cut Apollo programme controller is on record as saying "The main reason Apollo succeeded after the loss of the Apollo 1 astronauts is that we introduced excellent configuration management." It applies in this simulation as well. As you build launch vehicles, capsules and landers you'll get to understand how important it is to know exactly what equipment you've put into every vessel. Few things are as annoying as piloting to the other side of the solar system, successfully landing and planting a flag only to find that the gallant crew cannot get back on board to return to Kerbal because you've forgotten to add back on a ladder that you took off an earlier version to save weight. Just like in IT we get caught out by that unimportant change that nobody bothered to record. Why did you have to save weight? Well because nothing comes for free in this world, or out of this world. Everything has an impact on something else. Often that impact does not become apparent immediately so Root Cause Analysis becomes interesting, as it does in IT when the root cause isn't something that happened immediately before the outage. ...Timing. The same action can have disastrously different results if mistimed. Much like those IT departments who only decide to implement best practice ITSM after senior management have already lost all faith in them. Obviously that error of judgment is obvious to any one who has seen the progress of previous ITSM initiatives. That is unless those lessons learnt in the past aren't actually transferable. 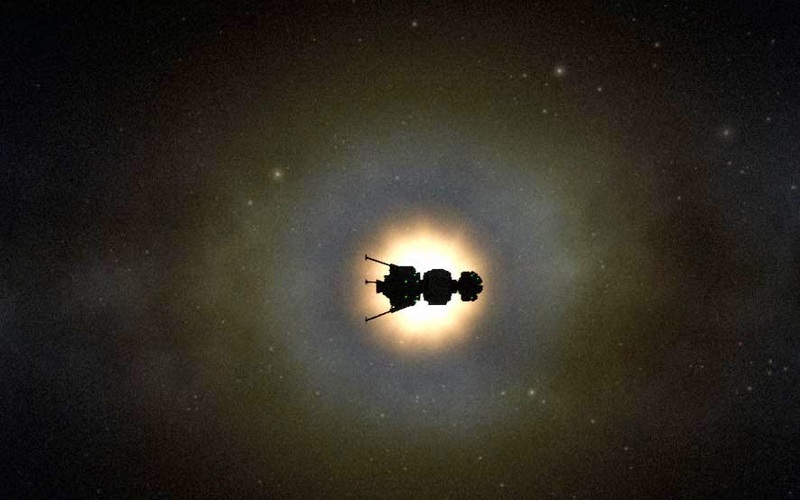 For instance a knowledge of how Russia and the USA used un-manned probes to go where no man had gone before doesn't really translate to the kerbalverse, where unmanned probes drain limited battery power much quicker than the almost indestructible kerbals. Just because something worked for one organisation doesn't mean it will work in your situation, and in particular you need to be aware of the dangerous halo effect. 2014. What a year. My absence of blog posts betokens just how crazily busy it has been and how quickly events have unfolded. So it is time to catch my breath and catch up with what I think have been some of the key developments before coming up with my predictions for 2015 and reviewing the ones I made for 2014. I think I've broken most of my personal records for travel this year. I managed to visit twelve countries and to present key notes on three continents. Compared to Kaimar Karu of course I am just an amateur at this travel business. What it has highlighted for me is how mature the ITSM market is becoming in India, Australasia and Scandinavia, and how complacent Europe and the USA have become. In the UK, in contrast, I'm seeing CXOs focusing exclusively on the value technology can deliver to the business, but I'm not seeing the majority of the UK ITSM community grasp the implications of that. I'm still appalled and shocked at how many times I've interviewed candidates for senior roles this year who have answered questions with "Because ITIL says so." We've seen, the beginning of big changes at itSMF UK but I think 2015 is going to be a make or break year for them, and, indeed, for the UK ITSM conference and exhibition market in general. It has been interesting to see AXELOS develop this year, and indeed, to be part of some of those developments. To some degree I can say the same of the ISO standards world, which seems finally to be waking up to multi-vendor models and the value of governance. On the othe rhand I get the impression that for many of us COBIT is appearing increasingly attractive. And then there is DevOps, or even, and I believe correctly, BizDevOps. 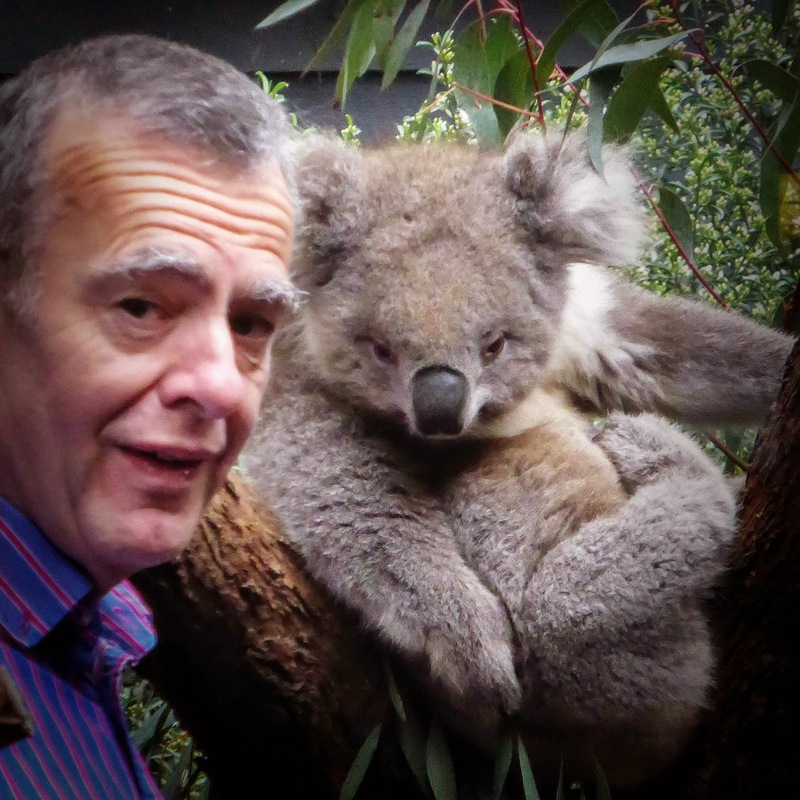 I can't talk about DevOps without talking about my trip with Stuart Rance to the itSMF Australia conference this year. Away from the conference I got to spend a lot of time with CIOs and the big message I got was how mainstream both Lean and DevOPs have become in this geography, and how keen they are to embrace SIAM.That has to be balanced against how simple the business models they are operating within seemed compared to the complexity in Europe. The DevOps debate I took part in at LeadIT was a fascinating and fun experience. If you thought it was good being in the audience, and the feedback we got suggests it was, then being in the behind the scenes preparation workshops was something else. What would you expect with the likes of Kaz Ferris, Malcolm Fry, Rob Stroud and Rob England involved? Another great experience this year was the itSMF India conference. Suresh has made a massive impact on itSMF India, and on everyone he has met this year as those who ran into him at SITS and the itSMF UK conference can probably testify. Personally it was also very satisfying to see TCS getting actively involved as gold sponsors. A final high for me was the meeting Stuart, Barclay and myself had with the newly fledged IT4IT community. Again this is something I'm immensely pleased that TCS is supporting. So what will 2015 bring, and what of SIAM in 2014? When I talk about ITSM and SIAM I'm increasingly struck by the development of an implicit underlying model that I guess is analogous to Maslow's hierarchy of needs. In the mists of time it seemed vital to get people to embrace the concept of process and following ITIL guidance. That still remains true, but it is really just an enabler for ITSM excellence. "We should start doing it this way, because that is what ITIL says." "What does IT need to change to be more effective in supporting the business?" "How do we make IT become more effective in supporting the business?" If we are honest most of us know what IT needs to do differently but what we don't know is how to make it behave differently. There has been some interesting research into the difficulties of making parents take up vaccination programs again after the damage caused by pseudo-scientific claims of a link to autism. What interests me, apart from the fact there isn't a single glib answer, is the value put upon an individual. or an organisation's, self image. "You aren't as capable as you think you are - or worse still you really are as bad at your job as you worry you might be at 2am in the morning"
So the question becomes how do we persuade people to change without undermining their sense of self? I don't have that glib answer, but it is a question we need to ask. This year's Service Desk & IT Support Show has now finished, the stands are packed away and many of the exhibitors and attendees have already jetted off to exotic locations. I'm in Coventry myself. Once again the show was a great success in the eyes of those who attended, despite the impact of the tube strike and Know14 taking place in San Francisco at the same time. In previous years I've struggled to get around the show to see all the stands and shake all the hands, so this year I made the conscious decision not to attend any of the conference sessions, excellent though the programme was. TCS also helped out by taking a stand this year. As you might have already guessed, I still didn't manage to get around the whole show. I did get to meet a lot of great people, including friends old and new. This really is a social event. For many of us a highlight of this year's experience was the visit of HP's Suresh GP, the charming and enthusiastic host of the Indian ITSM podcast. You can hear his extremely positive views on the event on the upcoming ITSM Review podcast. Which also provides me with an opportunity to once again congratulate Barclay Rae, on winning the ITSM Contributor of the Year Award, against stiff competition. It felt a little odd to be back on a podcast, especially since literally seconds before being dragged off to join it I'd publicly announced that I was planning to leave future podcasts to a younger generation. 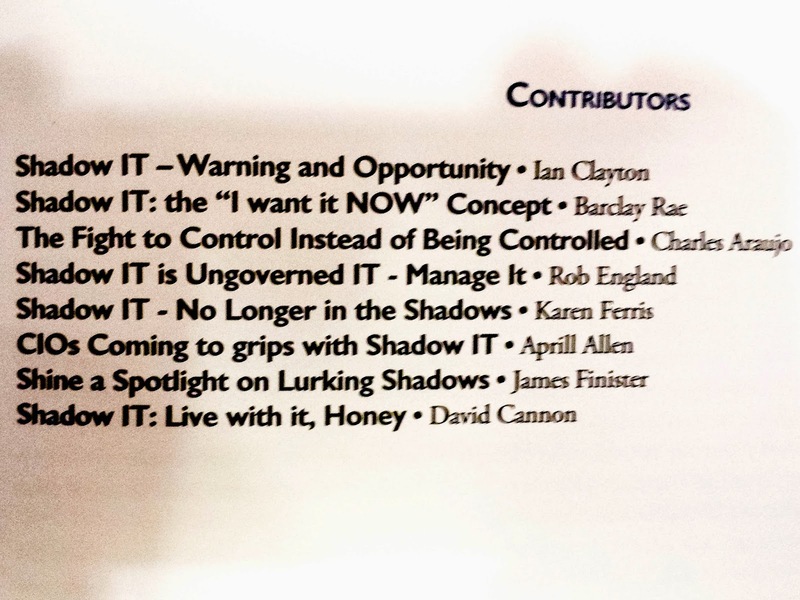 Incidentally Barclay and I are also among the contributors to LANDesk's guide to Shadow IT. Just look at this content page of ITSM goodness. And if you didn't pick up a hardcopy at the show don't worry because they will be releasing it as an ebook. A key point I made on the podcast is that if you are deciding which ITSM tool to go with thenyou need to look at their contribution to thought leadership, not just the technical capability of the tool. If you decided not to make the trip this year because of the travel disruption then I entreat you to make the effort to come next year when it will be returning to Olympia, and if you are lurking on SocMed then please please feel free to announce that you are going and come and join the party. On the subject of parties I couldn't end this post without a special thanks to SysAid and ITSM Review for organizing the social side of things after hours, and to LANdesk for keeping myself and the team stoked up on excellent coffee and, at the appropriate time of the day, Pimms. Incidentally there is a blogpost that needs to be written about how LANdesk's contracted in for the event barista went out of his way to be an active part of their value network. And finally a big big thank you to Toby, Carsten and particularly to Laura for making this event happen. In the word's of the Terminator "I'll be back"